The Late Late Toy Show has become the most watched show of the year on Irish television, with over 1.5 million people tuning in to watch the show on RTÉ One over the weekend. The Greatest Showman-themed show was watched by an average audience of over 1.3 million live on the night, a 74 per cent share of the audience watching at that time, and an 89 per cent share among children. A further 141,700 viewers watched their recording of the show on Saturday and 51,9000 viewers did the same on Sunday. In addition, 113,000 watched the repeat viewing on RTÉ One on Saturday. In total, the show reached 1.9 million viewers over the weekend. On the RTÉ Player the show had also record numbers, with 116,000 live streams, up 33% on last year, and over 100,000 watching on catch-up. The show was watched in over 100 countries outside of Ireland, with viewers logging on across the globe in countries including Myanmar, Burundi, Haiti and Mongolia. Host Ryan Tubridy said of the impressive figures: "I am blown away every single year at the reaction we get to The Late Late Toy Show. As a team, we are so honoured that people open their arms and welcome us in for such a magical night, and I sincerely hope it was as much fun for our viewers as it was for me on Friday. This year’s show was celebrated on social media with #LateLateToyShow trending worldwide on Twitter on Friday night and across the weekend. The highlights included Michael meeting Davy Fitz, and young Scott who donated bone marrow to his cousin Grace, with these clips getting over a million views between Facebook and Twitter. 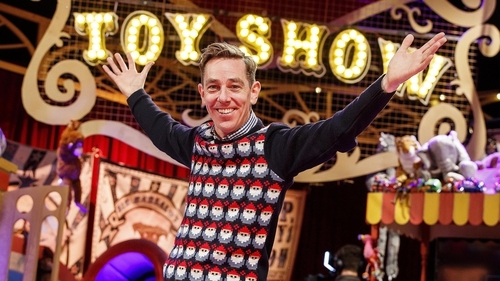 Relive the BEST moments of The Late Late Toy Show 2018 here. See what viewers thought of this year's show here. Take a look at a gallery of the 2018 Toy Show here.